Google is always one step ahead when it comes to designing technology support for human help. Every day, the world deals with terrorism, accidents and unfortunate circumstances where people tend to worry about their loved ones. A little help from the greater community may provide an aid, amplifying their will to fight with the situation. With this motto, the tech giant has updated their applications and search results with an SOS alert feature. Yossi Matias, the vice president, Google explained in a blog that during a crisis your search about the incident may lead to generate stories, local emergency contacts, and in-kind information. If you are inside the affected circle, you may get alerts on your phone even if you have not searched. If you are outside the zone, you may still fetch information by tapping keywords in the Google search box. You will also be able to retrieve updates regarding the situation, donation schemes and external sources providing similar information. You will also be able to get information while browsing Google Maps with the specifics of the incident. Once your search result is ready, you will be prompted to tap a card having useful information about the incident, relevant websites, emergency contact etc. The Google community has joined hands with many organizations such as the Red Cross, the Federal Emergency Management Agency, the Philippine Atmospheric, Geophysical and Astronomical Services Administration. This partnership resulted in technical add-ons that will help people survive the situation. As stated by Robert Glenn, Director at FEMA, previously, people used to rely on TVs and radios to know about any such crisis but now with the help of smartphones and Internet, the process has become easier and faster. 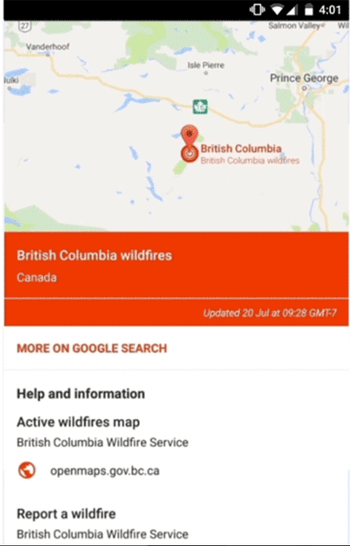 Including SOS alert, Google has various philanthropic and support wings such as Google Person Finder, Google Crisis Map and Google Public Alerts. Moreover, it also provides grants and volunteers for working in the real field.